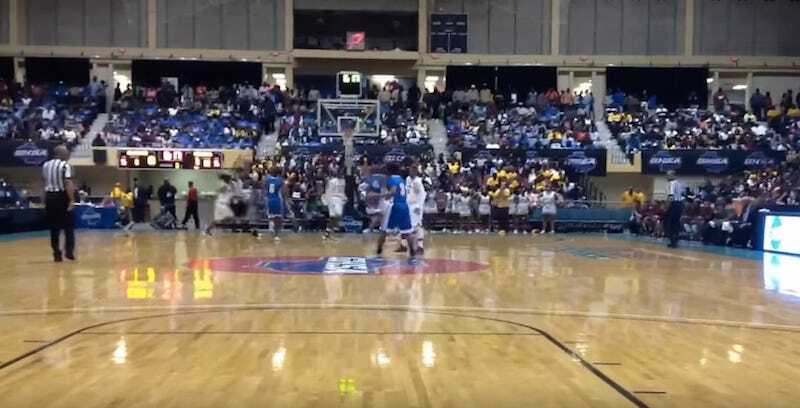 Georgia high schools playing in the state basketball championships at the Macon Coliseum this weekend discovered that the court used for the games wasn’t regulation-size. The hoops were incorrectly positioned an extra foot away, but instead of fixing the error, the Georgia High School Association played the games and chalked it up as an equal disadvantage for everyone. “The goals were the same distance into the court at both ends of the floor,” said GHSA Executive Director Gary Phillips. “The playing conditions were exactly the same for both teams on the court and for all of the 14 championship games that were played. So I can’t see any reason we would consider changing the outcomes. “Only one coach even mentioned a possible problem, and my basketball staff watched the games closely and did not notice any appreciable effect on the shooting or the play of any of the teams. Some of the teams even shot extremely well from both the floor and the free throw line. But, overall, it looked like typical championship play. Miranda, as most coaches would, chalked it up to nerves and exaggeration.